Ever go to the gym and notice the popularity of the elliptical machines? Luckily, many gyms have plenty of them to cater to any number of people who’d like to use one. But, sometimes, you find not an elliptical insight available. So, you drudge over to the treadmills. There are many benefits to working out on elliptical machines that make many users choose this over other exercise equipment. So many of these benefits are influencing people to buy one for themselves at home! In this review of the top rated ellipticals, I hope to guide you in choosing the right machine to fit your needs. An elliptical machine is a stationary exercise machine that simulates walking, running or stair-climbing. It has large footpads that move with your stride so that you can avoid excessive pressure on your joints. Many ﻿elliptical﻿ machines have moving handlebars as well, making them great for full-body workouts. Unlike running where you propel yourself forward, the elliptical’s pedal moves in a circular motion in tandem with your stride. A weighted flywheel usually stabilizes the elliptical as you pedal. The heavier the flywheel, the more stable the ride feels and the more resistance you’ll have. Most ellipticals come with computer features used to track your progress. Some even offer workout programs. So, what makes the elliptical machine so special? Low-impact. In comparison with running, the elliptical offers a great ﻿workout﻿ without causing high-impact on joints. Since the large foot pads move with you, you can get the same running motion without causing excessive pain. This makes ellipticals great for people of all ages and ability levels. Safety. Since elliptical pedals move with you lowering impact, the elliptical feels more secure and safer. It’s the feeling like your feet are never leaving a surface so you are supported for your whole stride. ​Great workout. Low-impact does not have to mean low-energy. True, you get to adjust your intensity, but if you would like a more intense workout, high speeds on the elliptical can really get your heart pumping. Many ellipticals also have intensity options for resistance, incline, and workout programs. ​Full-body workout. Working your arms with the moving handlebars on most ellipticals will get your whole body toned. You also have the option of reverse pedaling on elliptical, which works your ﻿calves﻿ and ﻿hamstrings﻿. ​Easier to peruse media. Because elliptical machines run in a smoother motion than running, it’s easier to read on your Kindle or watch Netflix on your tablet. Just make sure the elliptical has a media ledge, to begin with! It’s also important to note the different types of ellipticals. Rear Drive. A rear-drive ellipticals have the flywheel (or drive system) located in the back of the trainer. The pedals are placed in front of the flywheel, creating a more circular and smooth motion. This elliptical design tailors to a more upright feel for the user and reduces stress on the lower back. Rear drive trainers are also quieter due to fewer moving parts. Front Drive. As opposed to the rear-drive elliptical, the front drive elliptical places the drive system on the front of the bike. The pedals are behind the drive system making the exercise feel more like a stair-climber because the user leans forward a bit more. These elliptical machines have more parts making them noisier. This means they could also require more maintenance. 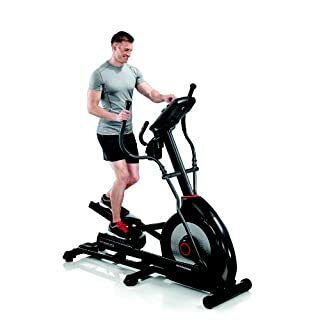 Front-drive elliptical machines are popular, though, due to their lower price range. Center Drive. The newest technology in elliptical machines, a center drive elliptical places the flywheel centrally on either side of the pedals. This creates a similar balance and feel of a rear drive elliptical. These machines tend to have a smaller footprint (the flywheel is underneath you) and run very quiet and smooth. These tend to be the most expensive. 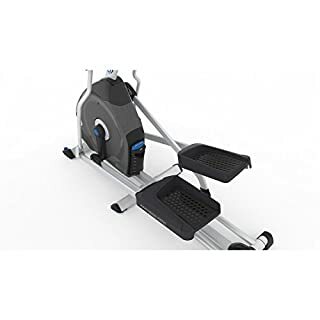 Hybrid Elliptical Trainers: Hybrid elliptical machines have an adjustable seat, which adjusts to either a seated or a standing position. The flywheel is located at the front of the trainer but closer to the user than a front drive machine. In a standing position, it has the same feel as a front-drive machine. In a seated position, it can mimic the feel of a ﻿bike﻿ or even a recumbent bike depending on the seat position. Folding Elliptical Machines. As you could probably guess, folding elliptical trainers have a feature allowing them to be folded to save space. There are lots of great elliptical machines out there, but there are only a few of the best ones for in-home use. Some have more features than others do, but most are known for being stable, durable pieces of equipment. They should be able to handle your most intense workouts. There are a few different types, so be sure to pay attention to the features that stand out to you. Not all elliptical machine reviews are created equal. 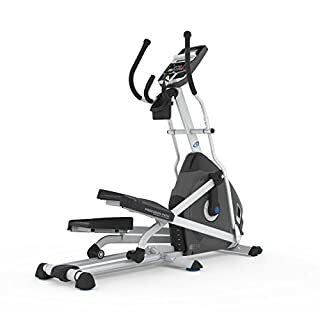 Below I have reviewed the best rated elliptical machines, and hope to help you find your favorite one. Sole Fitness gives us the top elliptical trainer in the E35 Elliptical. Every feature and design detail has been made specifically tailored to any user. This elliptical was made by engineers and physical therapists, so you know that this machine was made with care. The front drive system is made with Sole’s “Whisper Drive,” implementing a 29 lb. heavy aluminum flywheel for friction-less resistance. With 20 levels of resistance and a 375-lb. weight limit, you can feel confident that this elliptical will be able to keep up with your toughest workouts. Fifteen-inch foot pedals provide plenty of space and stability for you. They’re designed with a 2-degree inward rotation to reduce ankle and knee stress while also complementing your natural stride. They can also be tailored to match your foot type (high arches, flat foot, etc.). It has a 20-22-inch maximum stride length making this a versatile machine for any size user. The E35 also allows for up to a 30” inch incline that’s powered automatically. You can ramp up the intensity without having to stop your workout mid-stride. A blue backlit 7.5-inch LCD console displays your key figures: time, distance, calories burned, pace, etc. The console tilts to adjust to your eyeline making for a user-friendly view of your progress. You get six standard workout programs, two custom programs, and two heart rate programs. Monitor your heart rate with the pulse grip or chest strap monitoring provided with this elliptical. The handlebars allow for multiple hand-place options. The incline and resistance controls are built into the handles. This is one of my favorite features of this best elliptical for home use. As an added plus, you get a media ledge, water bottle holder, speakers, and fan. The warranty offered is a lifetime on the frame, five years on electronics, and two years on labor. With all of these fantastic features you can’t really go wrong with the E35. 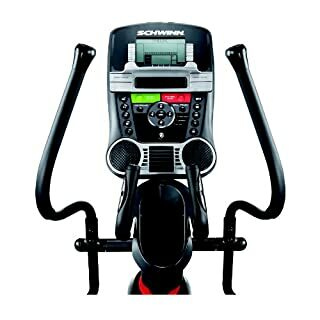 Schwinn also made a quality machine in the 430 Elliptical Machine. 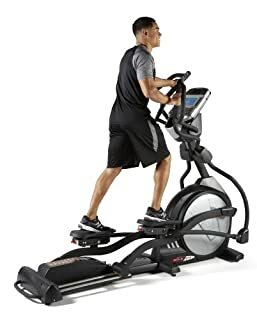 This best home elliptical comes in at a decent price, much lower than the Sole’s E35, and offers a great number of features. It’s one of the best ellipticals under $1000. This elliptical uses a high-speed inertia perimeter weighted flywheel for consistent strides with up to 20 levels of resistance. You also get a 6-position incline up to 10 inches. This equipment handles weights up to 300 lbs., a bit lower than the previous elliptical, but still not bad. Probably the best feature of this elliptical are its computer features. A dual-track LCD window system monitors 13 display feedbacks. It tracks your important workout data: time, revolutions per minute, distance, pulse, speed, calories, resistance level, course profile, HR zone indicator, and % complete indicator. Twenty-two workout programs are included: nine workout profiles, eight heart rate programs, two custom programs, two fitness tests, and quick start. The nine standard programs include three fun rides, three mountain rides, two challenges and one interval ride. 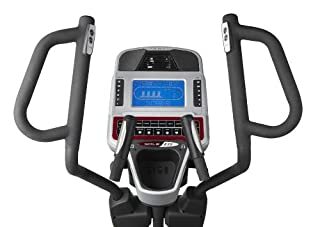 The easy-to-use interface offers goal tracking, which you can connect, using Schwinn Connect or MyFitnessPal. These are apps and online sites that you can use to see your progress over time and stay motivated. Online tracking of workout progress through an elliptical is a great feature to have. Plug your device into the charging USB port, which allows you to charge your device as well as connect to the speaker system on the elliptical. The two-LCD displays means you can cover one with your media while still track on the other. Added bonuses are the transport wheels. Not many other ellipticals offer the transport option, so it’s nice that it’s offered on this machine. The fan and speakers are not the best, but you’ll find that this seems to be the flaw of most elliptical machines. The most important features are the durability, computer features, and warranty. The warranty offered on this elliptical is fifteen years for the frame, two years on parts, one year on electronics, and ninety days for labor. This is a great warranty so you can feel safe buying the machine. Similar to the Schwinn 430, Nautilus created the E614 Elliptical. It is made with similar computer features as well as ability to connect your workout progress via key workout apps and websites. This makes the Nautilus E614 a great choice for people who like to stay motivated by tracking key numbers. It comes with a dual-track LCD display. You have the opportunity to track your progress by exporting your workout data to Nautilusconnect.com or MyFitnessPal. Within the computer, you get 2 user profiles and 22 workout programs. 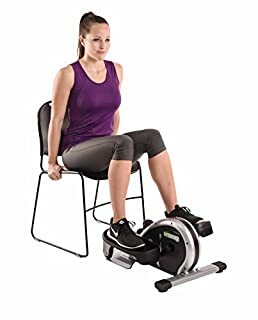 Pair this with 20 levels of resistance and a 20-inch stride length and you have an elliptical that works well for almost any user. Those with longer legs may like a machine with a little more stride length. As well as tracking your heart rate using the grip sensors on the handlebars, you’ll be able to track time, distance, revolutions per minute, calories, and level. You also have six incline options, although they need to be manually adjusted. This can prove inconvenient if you like to change your incline mid-workout. For those who like to keep the incline level stable throughout their workout, this elliptical will do just fine. This elliptical has been made with ergonomics in mind. The large articulating footplates are made with extra cushioning for comfort. A high-speed, high inertia perimeter weighted flywheel makes the ride smooth and steady. Oversized crossbar tubing has also been added for stability. The static handlebars are placed strategically to match the natural placement of the arms. Nautilus has really thought through every aspect of this elliptical with fine attention to detail. This machine is able to handle weights up to 300 lbs. You also get transport wheels, speakers, a 3-speed fan, and media ledge. The warranty comes in at ten years for the frame, two years for mechanical, one year electrical, and ninety days for labor. All this quality is offered for a decently low price compared to other ellipticals. It’s one of the best elliptical machines for home available. 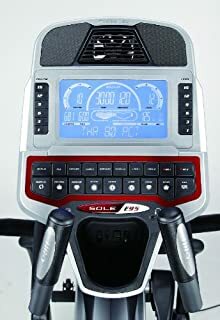 The Sole Fitness E95 Elliptical Machine is much like the E35 mentioned at the top spot of this list. The E95 comes with a lot of the same features, with some extras thrown in and for a higher price point. The extras offer more stability and more data-tracking capability. 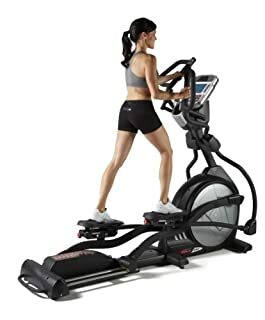 This heavy-duty best elliptical trainer has the same ergonomic quality as the Sole Fitness E35. Fifteen-inch pedals with comfortable foot articulation and 2-degree inward rotation keeps knees and ankles safe. The pedals can be adjusted to match your foot type preventing numbness in the toes and Achilles pain. The automatically powered incline is fully adjustable up to 30 degrees. You get pulse grip monitoring via handlebars as well as a heart rate chest strap. The flywheel comes in at 34 lbs., a heavier flywheel than the E35 making for a more stable workout. The same quiet drive system keeps this elliptical whisper quiet. Many users can hardly believe how quiet this machine is, even at higher speeds. You get twenty levels of resistance to work out as hard as you’d like. Incline and resistance can be adjusted using the larger LCD display, another feature differentiating the E95 from the E35. The computer has more capability. The blue backlit 9-inch LCD display is larger and tracks all your key figures. You also have plenty of workout program options: 6 standard programs, 2 custom programs, and 2 heart rate programs. Warranty includes lifetime on frame, 5 years on electronics and parts and 2 years for labor. Like the other ellipticals, you get speakers, a media ledge, water bottle holder, and a cooling fan. This equipment is a durable, sturdy elliptical that will keep up with your toughest workouts. The Stamina In-Motion Elliptical Trainer is unlike the rest. It’s a foot-pedal only chassis that works well as a trainer to use under desks or for other multi-tasking purposes. This small elliptical machine comes with color options; choose from either green or orange. It is compact and lightweight, making it easy to transport from one place to another. It’s low-impact design is meant to protect the user’s knees, hips, ankles, and back. It’s made with a sturdy steel construction and non-slip pedals as well. A multi-functional fitness monitor tracks time, strides per minute, total strides and calories burned. You can adjust the resistance of the pedals using the tension knob. It has the capability to be used either standing or seated, but many users may find that it is safest to use when seated. Many people may feel that they may fall over while using it standing. I would suggest, if you would like to use it standing, that you hold on to some sort of support- a desk or rail- at your chest level to ensure you stay stable. Most people use this equipment in a seated position. You can set it in front of the television during your favorite TV show, underneath your work desk, or anywhere else, you find yourself seated for long periods of time. There seems to be some durability issues with this equipment. This may also be a reason more people prefer to use it in a seated position as opposed to standing. The warranty is also not very impressive with one year on the frame, and just ninety days on parts. Durability issues are definitely something to be aware of, but many users will find that this portable elliptical trainer suits their needs. Perhaps some people would like to have one of these under their desks as well as a full elliptical trainer to workout out full body later. This is also the best elliptical under 500 dollars. As far as weight loss goes, you can feel confident that you will get a good workout on an elliptical. It is up to you to adjust the intensity if you would like to get a beneficial workout and significant fitness results. Perhaps ﻿treadmill﻿ running is better at taking the weight off faster, but it’s also more injurious on your joints. Propelling your body forward requires a lot of energy, which is why treadmill running can be better for losing weight. But, the constant high-impact on your legs, knees, and ankles on a hard surface cause many runners issues in the long run. The best elliptical machines allow you to exert energy without causing unnecessary impact on your knees, ankles, and joints. Ellipticals are best for longevity. Those who are older, have sustained injuries, or are inexperienced exercisers will find the elliptical a better option. Ellipticals can help you reach your weight goals as long as you rack up the intensity, and stay consistent in your workout routine. Consistently progress you incline levels, resistance levels, and workout programs over time. You can even engage in high-intensity interval training while on the treadmill making for more efficient weight loss workouts. Resistance. The more levels of resistance, the more options you’ll have to increase the intensity of your workout. More levels of resistance also mean you have room to progress. Resistance also takes into account the weight of the flywheel (if there is one). A heavier flywheel usually means more stable and consistent resistance. Stride Length. A longer stride length will be able to cater to taller riders, while a standard 20-inch stride length caters more to average height/shorter riders. Choosing an elliptical with the proper stride length for your body will mean a more comfortable workout. ​Incline. Options for incline levels are nice to have to increase the intensity of your workouts. Some ellipticals will have automatically powered incline while others you’ll have to manually switch. You can guess which is more convenient and which is more expensive. Maximum User Weight. The max user weights on ellipticals vary, so pay close attention to this number to make sure you get an elliptical right for you. The higher the max user weight, the more stable and durable the equipment. Height, Portability. Take into consideration where you would be able to keep your elliptical in your home. Checking the dimensions and options for transport wheels or folding features can be an important feature to consider if you’re tight on space. Many places have low ceilings, so ensuring that you will not be bumping the ceiling while on an elliptical is important. Warranty. A good warranty on frame, parts, technology, and labor can be especially important for an intricate machine like an elliptical. It could mean the difference between losing money and saving it. Cost. Different types of elliptical trainers offer different types of features and capabilities. Those with more capabilities will be more expensive and vice versa. Take into account your budget for your elliptical, and see what types of quality ellipticals you could get. Low price does not necessarily mean bad quality. Features. This is where customization comes into play. Make sure you have all the features that you could need and want on your elliptical machine. Workout programs, resistance options, and even simple features like a media ledge can make you more likely to stay consistent with working out. Now you can understand why elliptical machines are well-loved exercise equipment. They can help your reach your fitness goals and stay in shape without causing undue harm or stress on your body. You can decide for yourself how you feel about the treadmill vs. elliptical debate. There are plenty well within a budget price range, as well as those who would like something with more bells and whistles. There is something for everyone. Which of these best ellipticals appeal the most to you? I hope through reading this review you were better able to make a confident decision on an investment that will change your health and well-being for the better.